Despite being an urban capital city, Providence boasts an impressive array of green space and recreational opportunities. Nationally recognized for its outstanding design, Waterplace Park is the focal point of Providence&apos;s revitalized downtown. This four-acre urban park surrounding a tidal basin features an amphitheater, landscaped terraces, and boat landings. A series of Venetian bridges connects downtown Providence to the city&apos;s historic East Side. From here you can board a river boat or glide in a gondola down Providence&apos;s redesigned rivers. 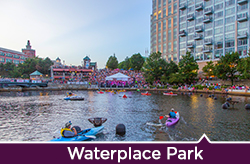 Waterplace Park is also the site of special events such as concerts and the acclaimed WaterFire. Cited by the National Trust for Historic Preservation as one of America&apos;s premier urban parks, Roger Williams Park was designed by Horace Cleveland, noted American landscape architect. With more than 430 acres, the park is comprised of waterways, walks, outdoor gardens, a Carousel Village, Museum of Natural History and Planetarium, the magnificent Temple to Music and Roger Williams Park Zoo. The Carousel Village features a vintage carousel, pony rides, a themed miniature golf course and kiddie go-boats. The Tennis Center has Rhode Island&apos;s only clay courts available for public use. The Dalrymple Boathouse has paddle boats and mini-speed boats and the Botanical Center provides an enviable evergreen oasis. A tiny jewel of a park on Providence&apos;s East Side, Prospect Terrace is the burial place of Rhode Island Founder Roger Williams and boasts a nonpareil city view. 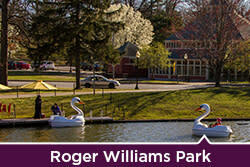 Located on Congdon Street, the park is also home to an iconic statue of the Roger Williams. 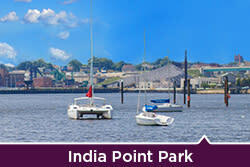 India Point Park is currently transitioning from a neighborhood park to an architectural focal point. An 18-acre city park overlooking Narragansett Bay, the park underwent a fantastic redesign and improvement under the city&apos;s I-Way public works project. Bike paths, playgrounds and waterfront views sparkle amidst lush lawns and a new pedestrian bridge. Water lovers can get their sea fix from the Community Boating Center, which offers sailing lessons and recreational boating opportunities.